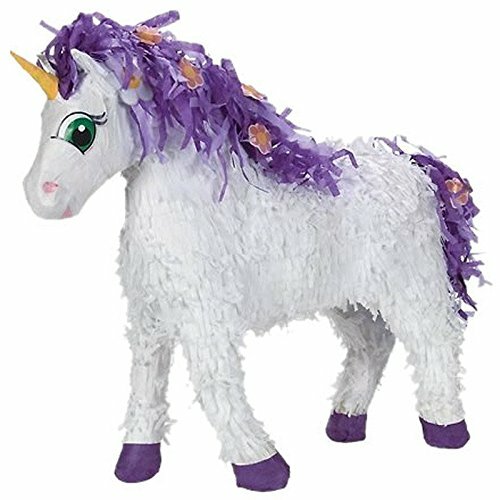 A Unicorn that you can fill with candy and use to play the pinata game! A Unicorn that you can fill with candy and use to play the pinata game! Delicately decorated with fringed cut tissue paper, purple strips of tissue paper for mane and flower cutouts as hair accents. Measures 21″ long x 6″ wide x 19″ high and holds up to 3 lbs. of candy and toys enough for 10 guests (sold separately). Bonus: You can use your Unicorn as a party decoration instead. Use it as a room decoration or toy for riding dolls once the party is over!